Many young professionals are taking on leadership roles in the auto industry and impacting the remarketing and used-car business. 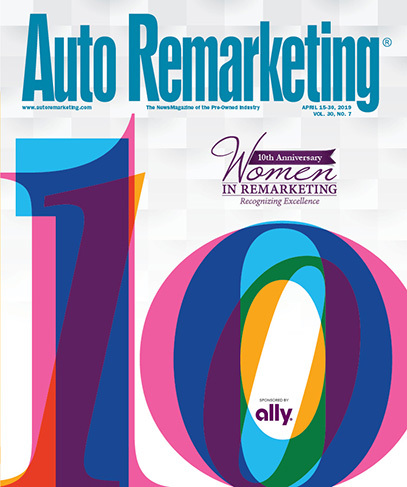 And 40 of these outstanding leaders are featured in the Sept. 1 edition of Auto Remarketing. In our fourth annual Remarketing & Used-Car Industry’s 40 Under 40 issue, you will find the current- and next-generation leaders of the business who are making big differences in the industry — and at their respective companies. Auto Remarketing is honored and thrilled to recognize these folks and celebrate their accomplishments. And be sure you don’t miss the special ceremony at Used Car Week to recognize this year’s group of honorees. We would also like to thank everyone for nominating dozens and dozens of outstanding individuals. This group represents just a fraction of the incredible young leaders this industry has to offer. We look forward to many more years of honoring these leaders. Jeremy Cunningham, Regional Auction Manager, Exeter Financial Corp.
Joseph Watson, Relationship Manager, Equifax Inc.
Laurie Dippold, Senior Director, Strategic & Brand Communications, KAR Auction Services Inc. In celebration of its inception 75 years ago, Manheim Darlington most recently commemorated it's over seven-decade history by hosting a May Diamond Jubilee Sale that followed four other special sales. Founded originally as Clanton’s Auto Auction back in 1943, Manheim Darlington has grown from a single-lane operation to an auction with a total of 12 lanes and digital channels that can turn up to 1,200 vehicles per week. “Our seven decades of success would not be possible without our team members, loyal clients and community support,” Manheim Darlington general manager Danny Brawn said in a news release. “This historical milestone allows us to reflect on how it all started, as well as consider the exciting possibilities ahead." As part of the auction's month-long festivities, a Polaris all-terrain vehicle that sold for $9,300 was auctioned off to benefit the American Red Cross, and Gary’s Auto Sales obtained a restored 1975 Chevrolet C-10 pickup truck during an appreciation event for dealers. Additionally, NextGear Capital offered its dealer clients special promotional credit terms of 75 days for $75, according to the auction. Last year, Manheim Darlington said that it completed a 768-panel, roof-top solar installation project at its main auction building and retail solutions facility that spans 48,000 square-feet. The solar array powers almost 30 percent of Manheim Darlington’s energy needs, according to the auction. Meanwhile, the auction's large retail solutions facility contains 32 vehicle-lifts, as well as two four-car paint booths. A trailblazing federal lawmaker who took a stand against the Consumer Financial Protection Bureau is set to address the independent dealership community. Rep. Stephanie Murphy (D-Fla.) will be the featured speaker for the Welcome Luncheon at the 2018 National Independent Automobile Dealers Association Convention and Expo, coming up June 18-21 in Orlando, Fla.
Murphy, who in 2016 became the first Vietnamese-American woman elected to Congress, represents Florida’s seventh district, which includes downtown Orlando. In only her first term, NIADA highlighted she has already built a strong record of supporting small business. The former businesswoman serves on the House Small Business Committee — she is the ranking Democrat of the Subcommittee on Contracting and Workforce — and has been the lead Democratic co-sponsor on several bipartisan bills aimed at promoting the interests of small businesses. Murphy was one of 11 Democrats who in May voted in favor of repealing the CFPB’s controversial 2013 indirect auto lending guidance. She is also a member of the Blue Dog Coalition, a group of House Democrats who according to their mission statement are “dedicated to pursuing fiscally responsible policies, ensuring a strong national defense for our country and transcending party lines to get things done for the American people.” She is co-chair of that caucus’ Fiscal Responsibility Task Force. The 72nd annual NIADA Convention and Expo is expected to be the largest event in the used car industry thanks to NIADA’s recent acquisition of the National Alliance of Buy-Here, Pay-Here Dealers. The combined NIADA/NABD Mega-Conference will include a record 60 education sessions in five educational tracks — retail, BHPH, legal and regulatory, certified pre-owned and digital marketing — and the largest Expo Hall in the event’s history with more than 210 exhibitors offering the latest state-of-the-art products and services designed to help dealers compete and succeed in today's ultra-competitive used vehicle market. More details can be found through this website. With the event three months out, planning is in the works for the International Automotive Remarketers Alliance Summer Roundtable at the J.W. Marriott in Marco Island, Fla. This year's roundtable is set to run from Aug. 21 to Aug. 23. Registration for the event will open on Tuesday, and early registration fees will be available until July 23, IARA announced Monday. Additionally, there are also sponsorship related opportunities still available for companies to take advantage of. Spots are open for this year’s Tabletop Expo, as well as in this year’s program guide, according to IARA. “The IARA encourages any company interested in getting its name exposed to IARA's consignors to participate before all sponsorship opportunities are gone,” the company said in a news release. The summer roundtable’s full agenda, in conjunction with the keynote speaker, will be available at a later date. Click here for more information about the upcoming event. GM Financial is hosting its fifth annual elite sales series, which gives dealers exclusive access to thousands of some of the best pre-owned GM vehicles at auctions across the U.S. At a series of one-day sales, dealers have access to hundreds of NAAA-certified Gold and Silver vehicles. This year’s sales series highlights the lineup of premium inventory for participating dealers with the theme “Elite Liftoff,” a tribute to space exploration. Elite sales also include promotional features, including a video advertisement. “With more off-lease inventory available across the country than ever before, this year’s focus is on ensuring elite sale vehicles are front-line ready,” said Dan Heinrich, senior vice president of remarketing solutions at GM Financial. “Our elite sales are designed to offer dealers access to high-quality, pre-owned GM inventory that, ultimately, increases profitability for their dealerships,” Heinrich continued. Each sale will feature a majority of NAAA-certified Gold and Silver vehicles to make it as convenient as possible for dealers to pick up the quality inventory they’ve come to expect from these sales. Last year’s sale series attracted more than 100 new buyers to GM Financial lanes, helping the company sell 95 percent of the vehicles offered. Along with high-quality inventory, dealers can expect high-quality service from auction sites. Four of the eight auction hosts are among GM Financial’s 2017 Auction of the Year award-winning locations. “We rely on our auction partners to support GM Financial’s objectives, efficiently manage the increasing volume of vehicles, exceed operational expectations and provide an exceptional buyer experience,” Heinrich said. “These auctions are committed to providing best-in-class service and ensuring quality inventory is readily available,” he went on to say. Some of the world’s leading experts in artificial intelligence (AI), applied analytics and decision management will gather in Miami Beach, Fla., later this month for FICO World 2018. Silicon Valley analytic software firm FICO highlighted that Sebastian Thrun, chief executive officer of Kitty Hawk Corp., and co-founder and president of Udacity, as well as chess grandmaster Garry Kasparov, will be the keynote speakers at FICO World 2018, which begins on April 16. With the theme of “Analytics for the Customer-Obsessed Business,” FICO World will focus on how organizations can advance their business and improve the customer experience using analytics. As the use of AI and machine learning expands in organizations, FICO World attendees will learn how to best leverage analytics and decision management technology to solve business issues. Thrun and Kasparov are two of the foremost innovators in their fields. Thrun is the CEO of Kitty Hawk, a personal airborne vehicle company, and co-founder and president of Udacity, an online private educational organization. He was a Google Fellow and vice president, and a research professor at Stanford University. Thrun works on revolutionizing transportation, education, and mobile devices. At Google, he founded Google X, and led the development of the Google self-driving car. Kasparov is a pioneering figure in computer chess, most famous for his two matches against the IBM super-computer Deep Blue in 1996 and 1997. Kasparov has researched and collaborated with many high-tech luminaries and companies on human-machine cooperation, the economic consequences of tech stagnation, and the future of intelligent machines. In addition to keynotes from Thrun and Kasparov, FICO World will offer more than 75 presentations across 12 tracks from thought leaders in a variety of industries, including speakers from Southwest Airlines, Citi, Mastercard, UBS, Sprint, and SunTrust. The event will focus on topics such as AI, cybersecurity, risk management, customer engagement and innovative applications of decision management. “FICO World 2018 promises to unlock the value of advanced analytics, human creativity, and industry best practices. Three decades of artificial intelligence advancements will take the stage for the benefit of our clients worldwide,” said Wayne Huyard, executive vice president for sales and marketing at FICO. As one of the foremost international conference on applications of predictive analytics and decision management technology, FICO World 2018 is sponsored by leading organizations in the field. Amazon Web Services (AWS) will be joining as a Platinum sponsor. Credit reporting agency Equifax and TSYS, a leading global payments provider, are Silver sponsors. FIS, a global provider dedicated to financial technology solutions, is also a sponsor. On April 16, prior to the official kick-off of FICO World, FICO is offering a one-day intensive hands-on training on the basics of analytically driven credit decisions. Attendees will be able to participate in various sessions presented by FICO experts, including consultants from Fair Isaac Advisors, FICO’s consultancy group. FICO will provide a comprehensive introduction on the FICO Score. Sessions will also address origination fundamentals, customer management, and collections and recovery. Attendees will leave Credit Bootcamp with best practices on how to incorporate analytics into operations and what decisions need to be made across the credit risk lifecycle. There is limited space available. Attendees can register for credit boot camp here. Both the National Automobile Dealers Association (NADA) and the American International Automobile Dealers Association (AIADA) welcomed their respective new chairman for 2018 this past weekend. The new NADA chairman and president of Extreme Dodge-Chrysler-Jeep-Ram in Jackson, Mich., Wes Lutz, outlined his goals and focus areas for the coming year at NADA 2018; while AIADA named its 2018 chairman — Salt Lake City, Utah, dealer Brad Strong — at its 48th Annual Meeting and Luncheon. Lutz, during his first official speech at 2018 NADA chairman, focused on how technology is changing the industry — for the better — as well as his priorities for the coming year. Lutz explained he plans to advocate for new-car dealer concerns within the industry, as well as in the legislative and regulatory sectors. Lutz said he will also encourage dealers to continue adapting to future retailing challenges. Earlier this year, he discussed with Auto Remarketing this very topic of change. Ridesharing, in particular, was one shift he addressed. Lutz explained at the NADA conference that auto dealers “have a role to play in the future of the industry,” in terms of investing in both new franachises and facilities, as well as new technologies. Lutz served on NADA’s board of directors until 2004, and then returned in 2017 as chairman of the association’s regulatory affairs committee. He also served as president of the Michigan Automobile Dealers Association in 2012. Most recently, Lutz served as NADA vice chairman under outgoing chairman Mark Scarpelli. AIADA’s new chairman is the co-dealer principal of Strong Volkswagen, Audi Salt Lake City and Porsche Salt Lake City. Strong, a third-generation dealer, runs the stores with his brother, Blake — two of which have been in operation since the 1940s. The pair opened their new downtown VW store last year. At the AIADA event, Strong focused on the role dealers play in the U.S. economy, as well as what they need to do to “defend their businesses” — with a particular focus on trade wars in light of recent news stemming from the Trump Administration. In fact, Strong, who has served on AIADA's Board of Directors since 2009, focused on the threat of new trade and tariff policies and what this means to international nameplate dealers in a recent column that ran on Auto Remarketing. "Washington has no sense of how price sensitive this industry is, and just how easily their tax and tariff schemes could send annual auto sales into a tailspin, costing thousands of jobs," Strong said. Millions of vehicles are flowing out of leases into the used-car marketplace, and many will land on dealer lots. But a blessing, too? Perhaps a huge one, if managed right. “The return of a record number of off-lease vehicles will be one of the biggest challenges dealers will face, but it’s also one of the biggest opportunities,” said Wes Lutz, the 2018 chairman of the National Automobile Dealers Association, in an emailed Q&A. “Obviously, the number of lease returns will put a lot of pressure on new-car sales, and used-car sales will likely increase because of the influx of late-model, lower-priced trade-ins returning to the market,” Lutz said. And inventory, it will be plentiful. Cox Automotive is anticipating 3.89 million off-lease units in 2018, which would be up from 3.59 million in 2017. While that’s more than an 8-percent hike, the growth in off-lease volume is slowing down a bit. Off-lease volume in 2017 was up more than 16 percent, following a more than 22-percent gain in 2016, according to data in a Cox Automotive presentation. Still, 2018 is expected to be a record year for lease returns, according to Edmunds. It could also be another record year for certified pre-owned sales, helped in good part by that off-lease volume, which tends to be the bread-and-butter of CPO inventory. In January, Cox Automotive economists said they were expecting approximately 2.7 million CPO sales in 2018, and if that comes to fruition, it will be the eighth straight year of record CPO sales. According to Autodata Corp., there was an estimated 2,645,718 CPO vehicles sold in 2017, compared to 2,642,986 sold in 2016. Lutz is the president of Extreme Chrysler/Dodge/Jeep, RAM in Jackson, Mich. Asked how top dealerships, including his, have handled increases in off-lease volume, Lutz points to CPO. “The rise in off-lease volume and subsequent CPO sales is an opportunity for both dealers and car shoppers,” Lutz said. “There’s a substantial price difference between a new vehicle and an off-lease vehicle. “The manufacturer-backed CPO programs offered at new-car dealerships provide consumers with numerous options for an affordable, late-model and low-mileage vehicle under factory warranty along with competitive financing rates and other perks,” he said. Of course, lease returns aren’t the only used-car challenges faced by franchised dealers, just as CPO vehicles aren’t the only used cars they sell. Another issue in recent years has been the margin pressure on used cars. Asked if margin pressure was still an issue on the pre-owned side, Lutz said: “There’s margin pressure on generic late-model used vehicles. By that I mean, a rental fleet that orders the exact same model and brings them to the market at the same time will exert a lot of pressure. “There’s not so much pressure on unique models or personally pre-owned vehicles returning to the used-vehicle market. For example, there would be a lot pressure on retail pricing if 100,000 minivans — all equipped the same — went to auction and resulted in everyone having the same product on their used-car lots,” he said. So the president of Extreme Chrysler/Dodge/Jeep, RAM in Jackson, Mich., owns a car that gets him where he needs to go. But when Lutz drives that car to another home he has in downtown Chicago, he keeps it parked and takes an Uber around the Windy City. “Ridesharing isn’t replacing my personal vehicle. It can’t! But it’s adding to my options. So I don’t look at it as an either-or proposition, and I don’t think my customers do either,” Lutz said in an emailed Q&A with Auto Remarketing. Lutz, who is the 2018 chairman of the National Automobile Dealers Association, said this story is emblematic of how consumers typically approach vehicle ownership these days. And that’s something he chats with them about when they visit his dealership some 30 miles from Ann Arbor, Mich.
They’re not trying to get rid of their cars — but there are other vehicle access options when they need them. “The consumer is ultimately going to decide what the future looks like, but right now I don’t see any indication that consumers are looking to change the current ownership model,” Lutz said. “And I ask customers that question all the time when they’re here. “My interaction with our customers tells me over and over that they’re just not ready to share their vehicle, and they’re definitely not ready to give up their personal vehicle. Will that change? I think things are going to keep evolving, and that evolution will lead to greater and greater options,” he continued. The ridesharing usage Lutz talks about is just one component to an automotive landscape that is being changed by technologies in purchase, ownership and usage methods (digital retail, ridesharing, car sharing, subscription services) as well as tech within the vehicles themselves (autonomous vehicles, electrification). And, of course, there is overlap. One area on which NADA has its eye is how the government and auto industry reacts to some of these developments in mobility. But he emphasizes that dealers are not resisting this technological change, calling it a “wonderful and incredibly important” development. “But I think we’re going to be a really important advocate for the consumer as these things unfold, because we’re already seeing a tendency for the government and the industry to get way out ahead of what the average consumer wants in terms of autonomy, ridesharing and electrification,” Lutz said. “Our job at the end of the day is to serve our customers and provide them with mobility no matter how they want it, where they want it or what it looks like. We’re really agnostic as to what that product is,” he said. Another wrinkle in the mobility scenario is that that the true impact from such trends as greater electrification, autonomous vehicles and ridesharing on dealership sales and operations could be further down the road, Lutz said. Though he certainly is watching them. “Now, I think we’re a long way off from having these things in the marketplace in significant numbers,” he said. “But at the federal level, we’re passing laws and writing regulations now that will set the table for the deployment of these types of vehicles in the future, so dealers and NADA need to be engaged on these issues, and we certainly are. One area of the auto tech revolution that is already playing out — and has been, for some time — is digital retail and ecommerce in automotive. Like the approach to increased mobility options, Lutz welcomes the opportunity. And similarly, he and other dealers have prepared and adapted to the changes brought to the retail environment from ecommerce/digital retail platforms. “I think these all of these platforms provide great opportunities for dealers to do what they do best, which is develop strong relationships with their customers,” Lutz said. “The reason dealers are embracing digital retail is because they recognize that the Internet is simply a medium for dealers to build and maintain better and stronger relationships with their customers by communicating with them on a platform they might be more comfortable using,” he said. “My dealership has always been very progressive digitally,” Lutz said. “In the late 90s and early 2000s, we were told to prepare for the demise of the franchise system because the Internet was going to put dealers out of business. Instead, we sat down and sifted through all that information and, at the end of the day, we harnessed the power of the Internet to be productive for us,” he said. In a way, that has begun to take shape. Various third-party providers offer digital retail solutions that help facilitate sales online or provide ways the consumer can transact with the dealer online. Some online retail platforms have brought dealerships into the fold. Many dealers, as the world around them changes, have taken proactive measures to make the most of these online retail opportunities. Adapting to change, particularly the tech variety, are perhaps what dealers like Lutz do best.